Multitasking- something we do every day right? We might even call ourselves experts. We try to do it all, using the phone while driving, texting while walking, replying to emails during meetings, and browsing while eating. We think it helps increase productivity, because why take up time to do one task when you can finish several? But contrary to popular belief, multitasking doesn’t help improve anything. When it comes to attention and productivity, our brains have a limited capacity to stay focused and perform. Moving back and forth between several tasks may actually lower efficiency, because your attention is spent on the act of moving in between tasks rather than the tasks themselves. So you never really give your 100% to any activity. Multitasking slows you down and it doesn’t save time. In fact, it will probably take you much longer to finish two projects when you’re jumping back and forth than it would to finish each one separately. Productivity is lost. It is estimated that switching between tasks can cause a 40% loss in productivity. It can also cause you to make mistakes in whatever you’re working on, especially if one or more of your activities involve a lot of critical thinking. The very act of multitasking causes physical stress. Doing two or more things at once causes you to miss out on one thing or the other in your surroundings. Studies have shown that mobile phone users, who were walking around, were technically looking at their surroundings but no part of the conversation they were having was actually registering. Your memory may suffer. If you try to do two things at once- read a book and watch television, for example, it is definitely possible that you’re going to miss important details of one or both. Even interrupting one task to suddenly focus on another can be enough to disrupt short term memory. It hurts relationships too. Studies show that just having a cell phone nearby during personal conversations even if neither of you are using it can cause friction and trust issues. It reduces creativity. Trying to focus on too many things can actually hamper performance on creative problem-solving tasks, making you less spontaneous. It can be dangerous. 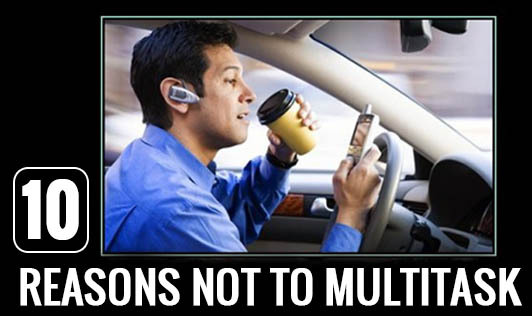 Texting or talking on a cell phone, even with a hands-free device, is as dangerous as driving drunk. Research also shows that people who use mobile devices while walking are less likely to look before crossing a road. So stop multitasking, and start focusing on one thing at a time and see the difference.